Often when discussing dog training, you'll hear dog trainers refer to dog training sessions. This can be confusing if you're not exactly sure how to conduct a dog training session. Understanding what makes a proper training session is an essential part of training your dog and will help you learn how to maximize your time and make your session the most effective it can be. What Is a Training Session? A training session is a short period of time you set aside on specific days to work on specific dog training commands, cues, actions, or behaviors. Most sessions are structured with a lesson or goal and set amount of time given to that goal. You can use training sessions throughout your dog's life, but they should definitely be used when you are starting obedience training. You can use dog training sessions to introduce and reinforce basic commands and other behaviors. Training sessions should be considered a commitment. Don't change them, cancel, or cut the time short unless absolutely necessary. Dog training sessions should last no more than 15 minutes. 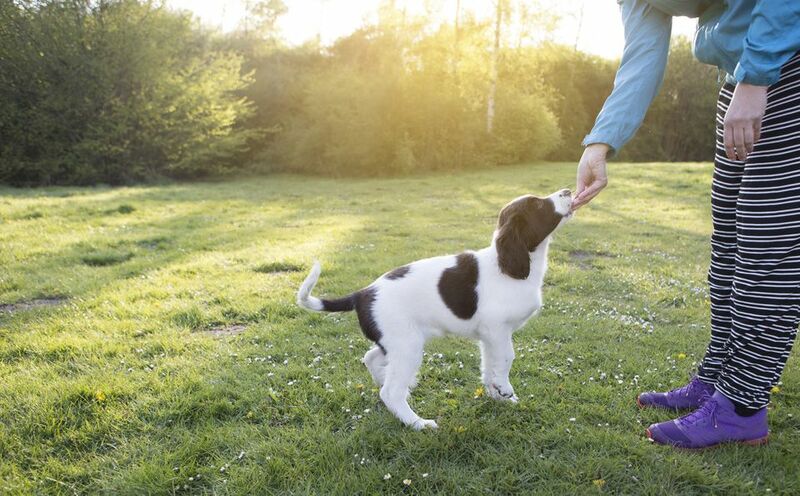 Young puppies or dogs who are easily distracted may need even shorter sessions. If you run your dog training session too long, dogs get distracted and bored, and there's a good chance they'll start making mistakes. When you set aside time for a training session, plan on working on just one command. The quick, intense lessons will help your dog learn, and sticking with just one command or behavior will help the dog stay focused. You can train them on more than one command in a day but try to stick to just one for each session. An exception might be if the session is not going well and you want to get your dog to do something they know so that the session will end things on a positive note. In this case, it makes sense to switch to a simple action your dog already knows. When you begin training a new command, dog training sessions should take place in quiet areas with little distraction. Too much activity or noise when you are introducing a command can make it harder to train a dog. Start somewhere quiet like your living room and work your way up to training sessions at the dog park. As your dog gets better, you can start adding in more major distractions, like other people or dogs. All dog training sessions should end on a positive note. This is one reason you don't want to keep them going for too long. A good stopping place is when a dog is rewarded for doing a behavior you like. By keeping training sessions short and rewarding, your dog will have fun and learn to love training. Again, if your dog can't seem to perform the desired behavior, switch to something easier for the last bit of the session. This will help you end the session with something positive. Dog training sessions are a great way to train dogs, especially those new to obedience training. Dog training sessions don't have to be the only time to train. It's wise to use the opportunities that happen every day to reinforce your dog's training. For example, if you are working on the "down" command during training sessions, have your dog lie down before they can get their leash on, get their meal, or play a game of fetch. Dog training sessions are a good way to introduce your dog to commands, but real life is the place to put those lessons into practice. A common mistake is to expect dogs to remember their training without reinforcement. Consider training a lifelong skill that always needs to be used and practiced. Whether you are working on basic commands or a fun party trick, your dog will only glean the benefits of training with constant practice (and praise). If you are having a very hard time training your dog, speak with your vet. They can likely provide tips or information for a dog training professional.